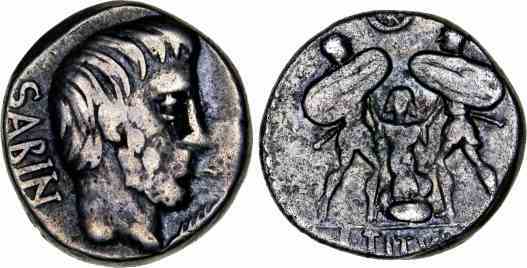 Silver denarius, 15mm, 4.05gm, issued 89 BC. Rome mint. Obv: Bare head of King Tatius facing right, bearded palm branch before, SABIN behind. Rev: Tarpeia facing, buried to her waist in shields, trying to ward off two soldiers who are about to cast their shields on her, star with crescent moon above. References: Sear 251, Cr 344/2a-b.